Find hotel near Ilia Chavchavadze Monumen .. If you are looking for yet another photo opportunity in this quaint town, the Ilia Chavchavadze Monument, won’t disappoint you. Essentially a tribute to Ilia Chavchavadze–a Georgian Political figure who lead a legacy to marshal modern National Georgian movement, this one of Georgia’s best pieces of art. If you want to a dig a little deeper, you can even get your hands on the book that essays this protagonist’s determination. His highly significant contribution to Georgia’s being today can also be comprehend to his reverence as Pater Patriae of Georgia, literally translated to Father of the Fatherland. The monument was erected in the year 1982. 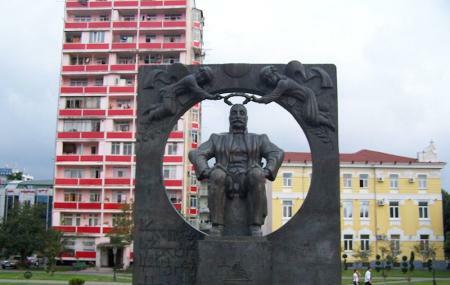 Situated right next to the Batumi Drama Theatre, you can come across this statue several times, as you explore the city. By bus, bicycle or foot. How popular is Ilia Chavchavadze Monument? People normally club together Motsameta Monastery and Пещера прометея while planning their visit to Ilia Chavchavadze Monument. Monument stands with apartment building in background.